‘The Mannequin Maker’ is a festival length documentary film by director Rachael Allan. It’s a revealing insight into the fascinating community around New Zealand’s last mannequin factory and very much a ‘people-based’ story that Rachael has filmed over the last 18 months, as she became ‘part of the furniture’ around the Purfex Mannequin factory. Working mostly alone with camera and microphones, she gained access into the world of high fashion, businesses large and small, and the private lives of individuals – all connected through this unique business, in Avondale Auckland. Behind the scenes footage of TV ONE’s Tamati Coffey filming the weather report (30th Oct 2012) for the breakfast show at the PURFEX mannequin factory in Avondale. Filmed hand-held on Purfex owner, Glen Wilkin-Holland’s iPad… Featuring Glen, Tamati and Kelly and the mannequins. The Expanding Dressmaker is adjustable at 23 critical fitting points and each fitting point can be adjusted individually. The model comes in two sizes: 10-16 and 14-20. Made of tough long lasting materials with a unique cog-based adjustment system. Covered in a special foam backed fabric for ease of pinning. Comes with adjustable stand, hemming bar and pin cushion neck. 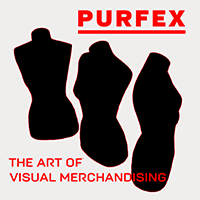 Email Purfex today and we will send you a full catalogue and price list.